Enjoy your maternity leave. I like your card. Oh, I remember this time of life when my first, David, was due! I couldn't wait to be off work, and after about 2 weeks or so, I was bored :))) Hope the same is NOT true for you! Hopefully you will fill this time with lots of cards! Sweet card today, Lucy. Yippee! Maternity leave! Enjoy it! 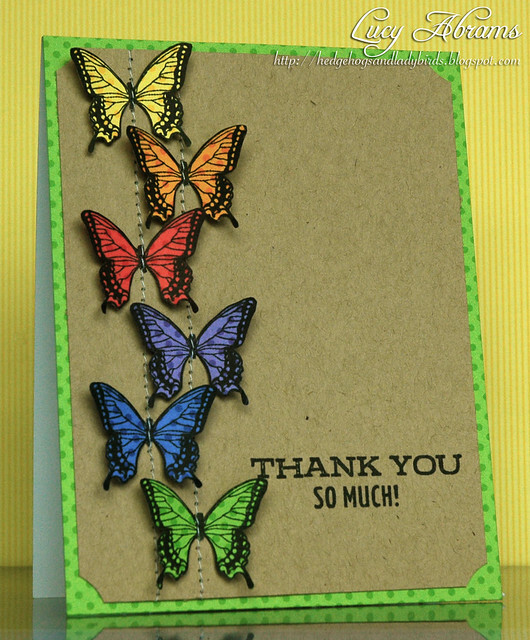 Love, love this card today, what a great idea to sew those rows across the butterflies! love your card - so simple and yet so rich and joyful! Good luck with everything! What a delightful card. Love how bright and cheery it is. Oh, this is getting so exciting, Lucy! Take good care, I'm sure the time will fly by and soon you'll be a family of three! Lovely card, too--so colourful and cheery!